When you play hearts, there are 26 points for each hand. Each heart is worth a point and the Queen of Spades is worth 13 points. The object of the game is to come away with as FEW points as possible. So everyone is busy dumping the Queen of spades and ducking tricks to take in as few points as possible. But there is one wrinkle in hearts that makes the game very good… if you can manage to take ALL 26 points, you “shoot the moon,” and then give everyone else 26 points (or subtract 26 from your score) when you succeed. It is aggressive- but if you are going to lose, you might as well lose while going down FIGHTING. And so goes it in football, where you can take some chances at an opportune moment and shoot the moon, trying to win a championship title. It is more about attitude than anything else. YOU CAN ONLY LOSE THE GAME ONCE. YOU CAN ONLY LOSE YOUR SEASON ONCE. TAKE YOUR BEST SHOT. GO DOWN SWINGING. SHOOT THE MOON. And so it came to be that the 1990 Giants lost their first string QB and everyone knew that the 13-3 team was a little less than the best of the best. They had lost to the Bills, Eagles and defending Super Bowl Champion 49ers during the regular season, so there were more than a few obstacles to winning a title. Each team made the playoffs. And then came the words of Everson Walls. It was an epiphany for me as a fan. He said: bring on the Eagles, we lost to them, bring on the 49ers, we lost to them, and bring on the Bills, we lost to them. Let’s play all three this postseason and go through all of them. It was brash. It was liberating. And it was necessary. This was Walls’ version of shooting the moon. Take’m all on. The Giants are 11-2 and we have theorized that perhaps the only team which still has the secret sauce for beating the Gmen is the Dallas Cowboys. Romo takes an above average offensive line and buys time, making the Dallas OL seem that much more effective. A Pro Bowl TE in Witten is the Giants achilles heal. We have seen this year that when a QB playing the Giants has time, our LBs/DBs look mediocre. If there is any team out there who has that Kryptonite, we believe it is Dallas. Do not be fooled by the mistakes, they will be a lot to handle. They were beating the Steelers IN PITTSBURGH with 7 mins left, 13-3, without Marion Barber, before they imploded. So do not underestimate them. BTW, for those of you who do, they are giving free money away (no they aren’t), the Giants are +3 point UNDERDOGS. Road warrior special. Time to prove the naysayers wrong. People are already talking about how too many people have been lost from the Roster (Umenyiora, Burress etc..) for the Giants to hold it together. They will be proven wrong. Knock them out of the playoffs this weekend. And if they make the playoffs anyway, knock them out of the playoffs again. The Cowboys will be a 5 or 6 seed as wildcards, they win their first game and likely will play the Giants as 1 vs 5/6 seed, the same way the Giants played Dallas last year. Everyone is thinking, the payback game, the media will be all over this one if it plays out that way, except this time you welcome it, you do not want it any other way. Why? Because you want to play the teams who are most capable. Think about it. When the Giants won their three Super Bowls they always had a tough road. In ’86, the 49ers were arguably the best of the rest. And the Giants had already beaten the Skins twice that year, so the conventional wisdom was that it would be hard to win three times, yet they did. The road to Super Bowl XLII was through TB, DAL, sub zero GB and the 18-0 Patriots. Do not duck Dallas, now or ever. Make your path as hard as it has to be in order to win a championship. Let others duck the Giants.. those teams will not even face the Gmen because they will lose before that. Bring on Dallas this weekend and AGAIN in the playoffs. If we do not get them because they fall apart beforehand, bring on someone else. This entry was posted on December 9, 2008 at 11:00 am and is filed under Everson Walls. You can follow any responses to this entry through the RSS 2.0 feed. You can leave a response, or trackback from your own site. You left out the Panthers who looked mighty impressive last night against TB. They ran the ball at will. But they were a power running game, not a quickness type game such as Philly. It will be a real test against them. And frankly since we play them in the regular season, it turns out that if the Panthers win their last 3 games, they get the home field advantage. This team played a poor game. Lets see if they can bounce back and play with fire and intensity. That was sorely lacking last sunday. BTW, if Philly runs it’s table, they will finish ahead of Dallas regardless of the outcome next week. I agree Andy. Bring it on! You always heve to earn it and this the way it will shake down. It dawns on me that after the Dallas game and because of Carolinas win last night that the “flex” schedule will almost certainly move the Panthers/Giants to Sunday night. The one redeeming quality about the Cowgirls is their chemistry. They might implode too even worry about them:http://sports.yahoo.com/nfl/blog/shutdown_corner/post/Jerry-Jones-is-apparently-tougher-than-Marion-Ba?urn=nfl,127609Just take care of biz one game at a time unlike this past game and they will get it done. Only team that can beat the Giants are the Giants.Name of the game this week is super physical. Beat em’ up and get in their heads….run at them, and 3 step passes. Put pressure on this team and they will beat themselves and turn on themselves…..no mercy. I want a 45-3 trouncing this weekend. A statement game! Panther’s game was just moved to Sunday night. I could be wrong, but I think if the Cardinals beat the Vikings this weekend, the Giants secure a first round bye. The best the Vikes could do would be 10-6, and the best AZ could do would be 11-5, but we beat them head to head, so even in the worst case scenario we win the tie breaker. The Giants are tough minded and I’m sure would agree with those sentiments. Being tough minded won’t be enough if our interior run D has suddenly gotten soft, or our ‘backers can’t cover, or our receivers don’t step up. Then again, I worry too much. that’s a bunch of BS! i say, beat dallas now to kick them out of the playoffs and play someone with less kryptonite. the 1990 giants were extremely fortunate to play the easily-beatable bears in playoffs instead of the kryptonite eagles who they most likely would have lost to [because of matchups for several years, usually the eagles swept the giants who swept the redskins who swept the eagles. go figure!] and never would have gotten the chance to execute fantastic game plans and play near perfect games along with a dash of luck to beat the 49ers and bills.the same with the 1986 giants. they could have easily lost to the kryptonite bears who somehow lost to the redskins who the giants could handle.while it is special when a team does beat ALL the odds, it is also less probable. The message here is that the mental part of winning is believing. 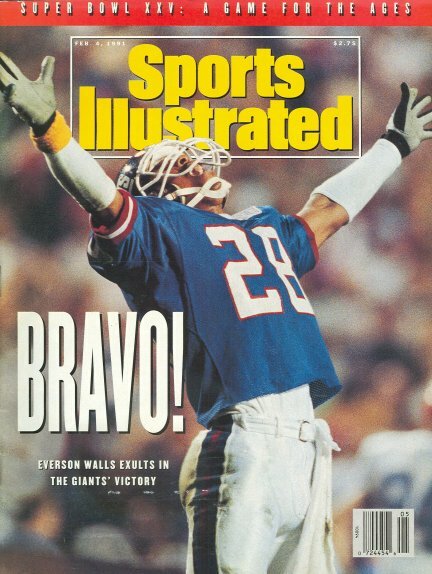 The ’86 gmen believed it could and would beat anyone, including the Bears. (Considering they were beating all comers by double digit margins, I strongly believe they would have taken the Bears. The 49ers imo were the 2nd best team, and they were thrashed by the Giants.) In 1990, you may be right, as that team needed the narrowest of margins on two occasions to get through and could have come up short against the Eagles. But at least they were ready for any game. ditka told his 85 bears the only team to fear is the giants because they dont know how good they are. well, the bears won 21-0 in soldier field that windy cold day–remember landeta whiffing on the punt in the end zone which chicago picked up and scored a td. i knew the giants were capable, but they just didn’t do it that day.bizarrely, from 84-90 the giants only played the bears 3 times: in the 85 playoff game mentioned above; once during the regular 87 [strike] season which the bears won again in soldier field 34-19 opening day; and finally in the 90 playoffs at home the giants won 31-3. the bears were the team i was really scared about as the giants had beaten the 49ers once and redskins twice during the season. the giants never beat that dominate bears team [the 90 team was not the same]. it’s too bad they did not play more often. [contrast that with the 49ers who they played almost every year. ]the 86 giants only had 5 games decided by more than 7 pts during the season including the last 3, but just before those 3 they won 5 in a row by 3, 3, 2, 3, 4. they definitely were not blowing teams out, they were squeaking by. but squeak by they did! they were tough! [i saw 3 games that year–preseason at denver broncos, at la raiders, and at minn vikings for phil simms’ favorite game [i can still see that 4th and 17 pass to bobby johnson to the right sideline]i’m sure the giants thought they could beat the bears, but the bears were exactly the type of team–great defense with pass rush and turnovers like philly from 88-91–that could beat them. we will never know. In ’86 I was at two games: (1) the Redskins regular season game when everyone had their sony tv walkmans and cheered the Mets in G7, drawing the Redskins offside for a few penalties. (2) the redskins NFC Championship, when it was SO cold but SO good, our first Super Bowl bid. That ’86 team was on a roll near the end of the season… that was what I distinctly remember.. the only time it was ever close in any of those games was halftime of the Super Bowl. Everywhere else it was under control, and I really believe they were ready for the Bears. All that matters is that they broke their cherry, got the ring.